All the new lens announcements (and no real new camera announcements) at the CP+ show in Japan just underscore what I've been writing for some time: to be a system, you need lenses. Canon — Two existing lenses. No third party support. (I'll have to update this shortly, but as I write this article, that's where we stand. Fujifilm — Five existing lenses, five more lenses on the roadmap. Some third party support beginning to appear. Leica — Tons of Leica lenses, both legacy and current, and from third parties. No real zoom lens support, though. Nikon — Eight existing lenses, seven patents on possible new lenses. No third party support. m4/3 (Olympus/Panasonic) — 32 lenses so far from the main partners, some now discontinued. Lots of third party support. Samsung — 12 lenses so far, with five others on the roadmap. No third party support. Sony — 13 lenses so far, with only two other known lenses on the roadmap. Increasing third party support. The "systems" to beat clearly are m4/3 and Leica M-mount, with Sony's E-mount starting to get a bit of traction, too. You have to look at which lenses are available, too. For example, while the Nikon 1 mount has eight lenses, two of those are cheaper versions of basically the same lens, which means that your real differentiating options are six possible focal lengths. Nothing wrong with that sort of duplication, but if you're looking for a system that has real focal length options, Canon, Fujifilm, and Nikon aren't there yet, at least not without resorting to adapters. Beyond that, both those mounts have many more lenses that are no longer made that are available in the used market. 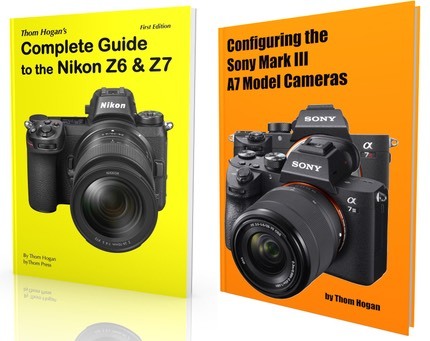 None of the mirrorless systems currently come close to approaching the overall lens availability of the two interchangeable lens leaders (Canon/Nikon). Even m4/3 with its early start and dual primary partners is only at half the level of available lenses. But here's something to consider: I only count 34 current Sony Alpha mount (DSLR) lenses at the moment. That means that m4/3 is posed to pass Alpha as the third mount with the most available first-party lenses. Things change dramatically if you look only at the crop sensor DSLRs and lenses. The Canon/Nikon duopoly has been resting on its laurels in crop sensor lenses, and m4/3 has easily surpassed EF-S and DX, and surprisingly, Samsung and Sony are closing in fast. Ultimately, cameras and lenses are the classic chicken or the egg problem. You can't sell a lot of lenses without having a wide range of bodies, and you can't sell a lot of bodies without having a lot of lens choices. The m4/3 and E-mount worlds are probably the only two that have gotten past the "which came first" problem so far. Canon and Nikon seem to like playing the "use our bigger lenses game." Just as they did with their crop sensor cameras, they're currently somewhat reliant on users getting an adapter and using the legacy lenses from the SLR/DSLR side to fill out holes. Personally I think that's a weak strategy at best, and one that will ultimately backfire on them. Fujifilm and Samsung are in the toughest holes, as their low camera sales volumes mean that broad third party support will be slow in coming. Thus, watch how fast these companies iterate their own lens lineups.